Still the largest consumer of travel products. Context Travel has been selling through travel advisors for many years, and is a preferred supplier of the two largest agent consortia - Virtuoso & Signature. onefinestay was as well. It would be impossible for anyone who attends Virtuoso Travel Week, with 6,000+ attendees spanning 3 hotels in Las Vegas every August, to believe travel advisors are on the way out. It’s the one week every year Bellagio employees aren’t allowed to take off. Here’s my take on the resilience of the travel agent industry, & a few thoughts about how advisors can ensure ongoing relevancy. What’s contributing to the resilience of the travel agents industry? Customer rate parity (+) - suppliers guarantee rate parity to their own published rates on site - it costs the same for the consumer to book through an agent. once consumers realize that booking a hotel or activity provider costs the same as it would if they booked direct, working with an agent suddenly becomes much more of a no-brainer. Additionally, if book the Four Seasons direct as an individual vs through an advisor or agency who sells a lot of Four Seasons product, which customer is more likely to get the upgrade when the suite is unsold? Supplier commission competitiveness & storytelling - in many ways the rise of the OTA was the best thing that could have happened for the agency industry. It created a structural reason for suppliers to seek alternative sources of demand. Booking.com is a $100 billion dollar company partially due to the juicy margins OTAs command from suppliers - standard for B.com & Expedia is 25%. This makes OTAs actually more expensive - certainly on a direct commission basis - than travel agent distribution. The OTA environment also creates real challenges providing suppliers with proper merchandizing for their products - it's really hard for differentiated suppliers to actually communicate what makes them differentiated with the standard templates and lack of branding. Advisors play a valuable role in product marketing for suppliers: working with advisors ends up also being a brand building activity. Consumer information overload & time scarcity - we are now bombarded with rich media about where to visit, where to stay, & what to do. As the mobile and desktop experiences have evolved and retina screens are in everyone’s pocket, lots of travel products have come online. It’s now easy to self-serve, but this has also resulted in a paradox of choice: sure it's straightforward to book all of these things now, but what do I actually want to do and who can I trust? Time spent traveling is precious time. Advisors can help cut through the noise and curate a personalized experience for their customers because they really know their preferences. For the most part, this is still not being done well online today. And here are a few things that need to happen for the agent industry to ensure it stays relevant. Structuring rules of engagement for cobranding & comarketing - suppliers like Context Travel are getting really good at direct to consumer marketing & brand building, and are making significant investments in these areas. Additionally, these businesses are being built around the idea of direct communication with customers prior to, during & after the event. Yet often advisors are overly protective of customer contact information to avoid getting cut out in subsequent transactions, which can create real operational challenges on the ground and missed opportunities for future trips. This will ultimately end up hurting the advisor, supplier, & customer. Suppliers need a way to market directly to customers, advisors need reasonable rules to protect commissions, & customers should be able to harness the investments suppliers are making in personalization for better awareness of destinations, accommodation & activities. Providing best practices & onboarding opportunities for new suppliers - most agent websites don’t have a way for new suppliers to pitch their products. This means that products offered by travel agents generally are from suppliers with the means to afford to market to agents or invest in becoming a preferred supplier of the consortia. Yet even that comes with speculative ROI for new suppliers who are time & money-constrained. The game favors those with the big marketing budgets & sales teams, hence why a lot of suppliers never get beyond the OTA and direct distribution. Creating simpler ways for quality suppliers without the same reach as more established companies to enter the consideration mix for agencies will ensure that travel advisors can offer innovative products alongside the more established ones. 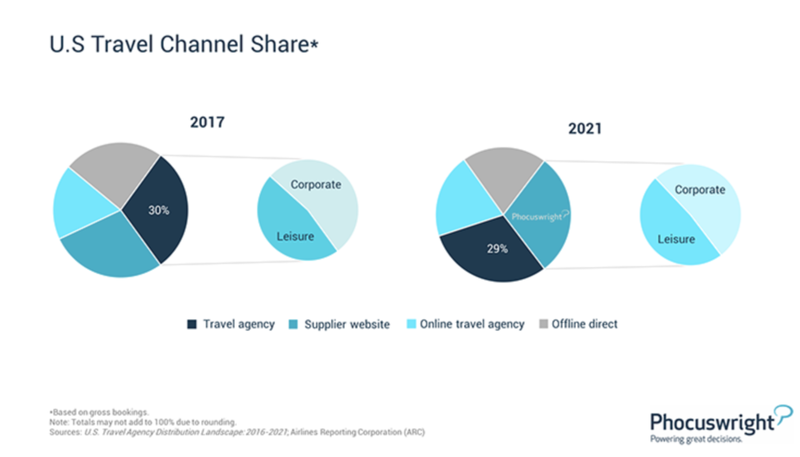 Travel products have many routes to market - OTAs, the various direct to consumer acquisition techniques, in-destination, & travel advisors. It’s hard to be really good at even one of these. However I’d argue for a differentiated, quality supplier the travel agent industry belongs near the top of the list.